The signing ceremony between RHEIN-KOESTER and Siemens was held in Hanover, Germany. 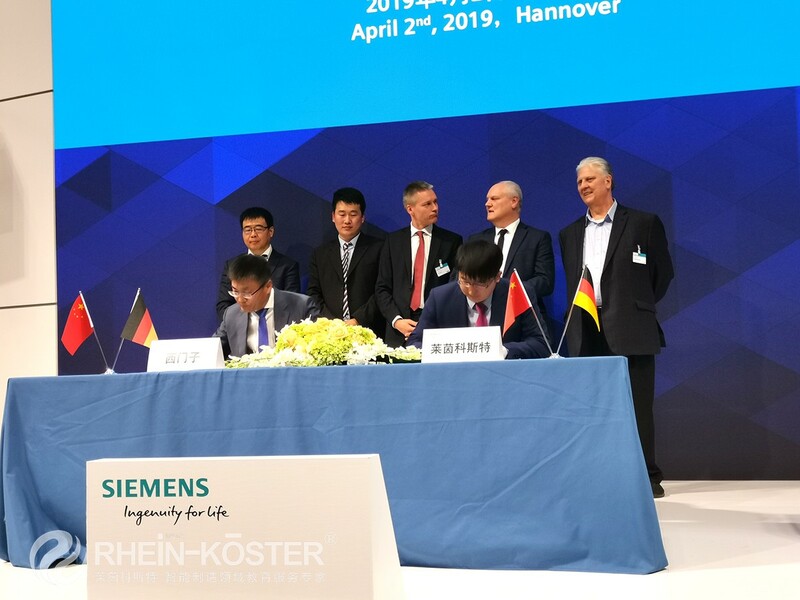 Mr. Hu Chengman, Executive Vice General Manager of Shandong RHEIN-KOESTER Intelligent Technology Co., Ltd, and Mr. Zhang Jinsong, Vice President of Industrial Sales of Siemens (China) Co., Ltd. signed the MindSphere MoU as representatives of both sides. Both sides are committed to the full promotion of MindSphere's digital cloud solutions in the field of education. Dr. Jan Mrosik, CEO of Siemens Digital Factory Group, Mr. Wang Haibin, Executive Vice President of Siemens (China), General Manager of Siemens Digital Factory Group, Mr. Steve Bashada, Executive Vice President of Siemens Cloud Applications and Services, Mr. Eric Moskwa, President of RHEIN-KOESTER and Mr. Xu Qiang, Technical Director of RHEIN-KOESTER, attended the ceremony and witnessed the signing of the contract. With the continuous development of"Industrial 4.0" and "Intelligent Manufacturing", digitaltechnology plays an increasingly important role in the industrial field. 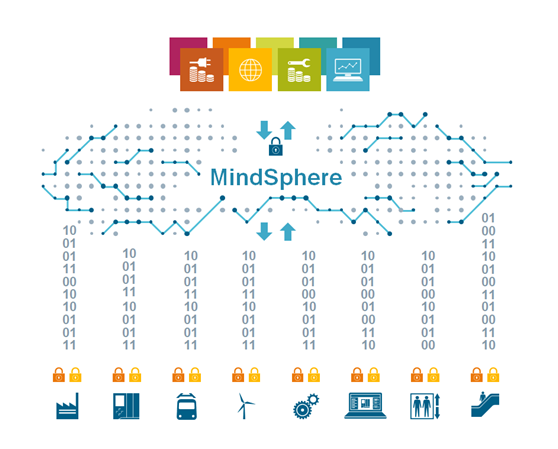 MindSphereis a cloud-based open Internet of Things operating system launched by Siemens.It can connect products, factories, systems and machinery to enable users tocontrol the huge amount of data generated by the Internet of Things (IoT)through advanced analysis functions. 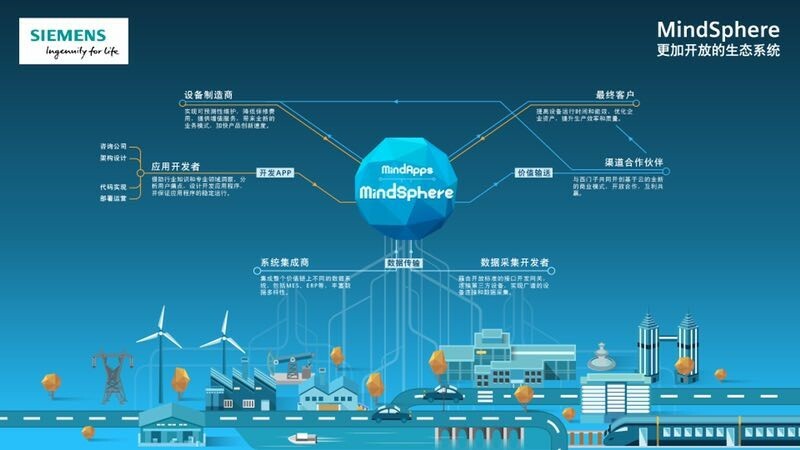 MindSphere is an open Internet of Things ecosystem serving the whole industrial field. It can help enterprises of different industries and sizes to collect and analyze massive data in industrial field quickly and efficiently through such working paths as data acquisition through industrial field, safe data transmission and storage, data analysis and simulation, data analysis and visualization of final results. Through the platform, enterprises can master and manage the startup rate of equipment, optimize energy efficiency, enhance industrial information security, thereby effectively improve process efficiency. Its birth enables equipment and products to keep in touch with the virtual world after they leave the production line, and extends the life span of "digital twins" from product design and production stage to the whole life cycle of products. Enterprises can also achieve more complete closed-loop manufacturing. RHEIN-KOESTER is a long-term strategic partner of Siemens. RHEIN-KOESTER cooperates with Siemens in the fields of intelligent manufacturing training system research, mechatronics and intelligent manufacturing talents training, enterprise intelligent digital technology transformation and so on. The design scheme adopts the latest control software and hardware system of Siemens in an all-round way. The cooperation between the two enterprises has achieved the perfect integration of technology and education, providing a large number of excellent services and products for China's intelligent manufacturing. 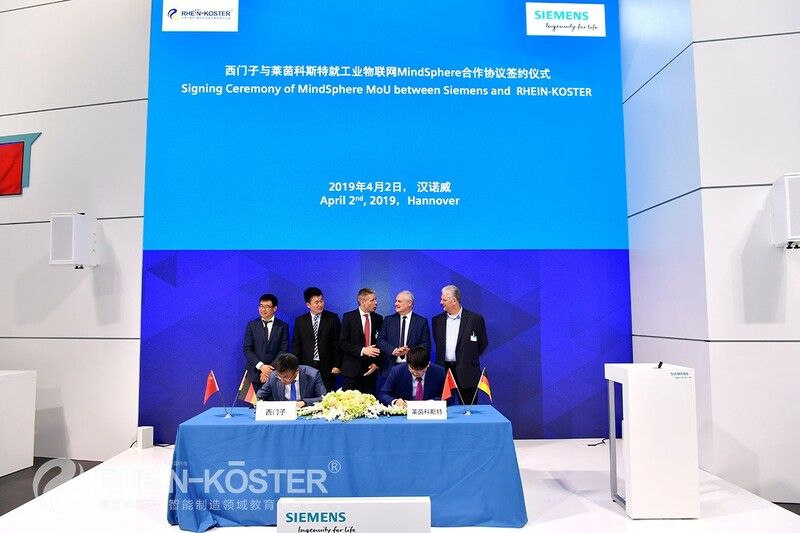 The signing of the MindSphere MoU between RHEIN-KOESTER and Siemens in Germany is a reflection of further deepen the strategic cooperation between the two sides. It can reach the same goal by the construction of intelligent manufacturing digital talents training system of RHEIN-KOESTER and the Siemens digital enterprise concept. 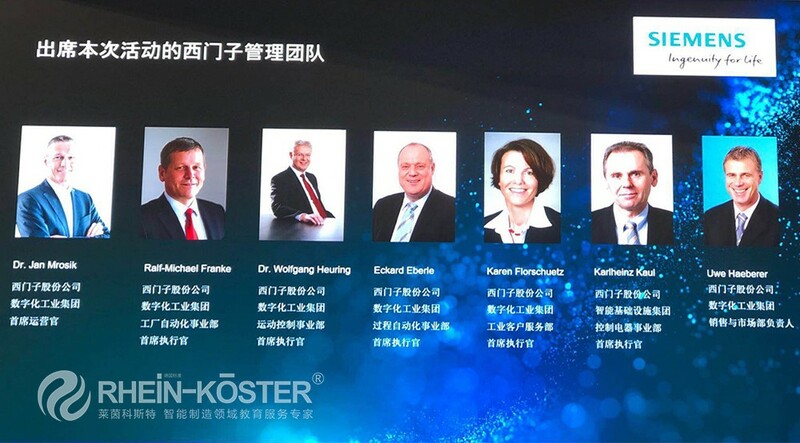 The introduction of MindSphere platform will effectively enhance RHEIN-KOESTER's core competitiveness, further open the "industrial 4.0" joint, achieve the re-upgrading of intelligent manufacturing mode, provide a more comprehensive and deep industrial service system for enterprises in the process of transformation and upgrading, and help enterprises turn from automation to digitalization and intellectualization. At the same time, it also makes the development and construction of intelligent manufacturing personnel training system more perfect, and provides a more effective and landable solution to cultivate compound high-skilled personnel in line with the international technological trend. 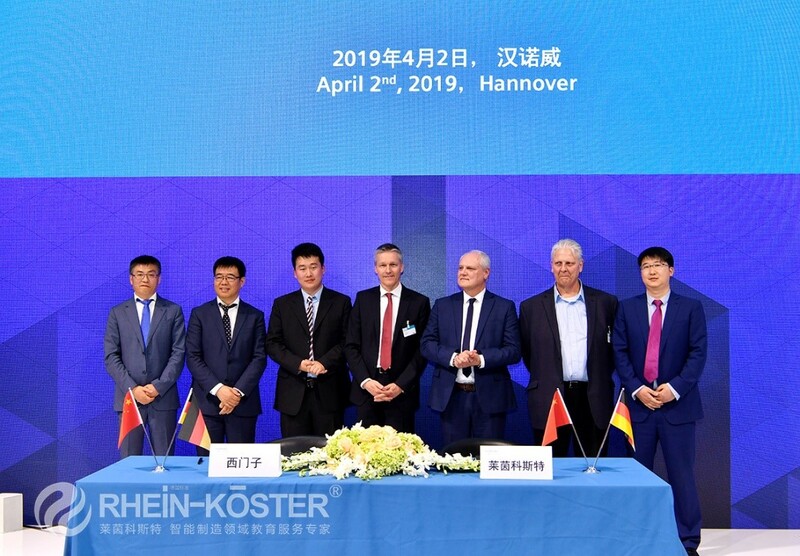 The fruitful results of the cooperation between the two sides will surely become a new chapter in the cooperation between China and Germany in the field of intelligent manufacturing and skilled personnel training.